100% cotton with satin ribbons, machine wash cold & tumble dry low. Fabric was pre-washed to minimize shrinkage. All ribbons have been heat-sealed to prevent fraying. I have been doing this for a quite a few years and my work is top quality. SLEEVES ARE BUTTONED. 20" SHOULDER TO SLEEVE EDGE. Native American style Shawl, Limited edition print. U-Neek Rabbit Shawls; Some people say they are like wearing a hug.Traditionally they are Native American shawls.We have fused them with other cultures and art.Custom orders are encouraged. Let us design one just for you.They can be used for prayer and by energy workers, healers, Pow-Wows and just for fun at the game with your favorite team. I EVEN ADDED TRIM TO THE CUFFS. I CAN DO THIS SHIRT IN THE BLACK, CREAM, OR BLUE DENIM AND IN SIZES S,M,L,XL,2X,3X,4X, AND 5X. LOTS OF WORK WENT INTO THIS SHIRT. HOPE YOU LIKE. Native American style Shawl U-Neek Rabbit Shawls; Some people say they are like wearing a hug.Traditionally they are Native American shawls.We have fused them with other cultures and art.Custom orders are encouraged. Let us design one just for you.They can be used for prayer and by energy workers, healers, Pow-Wows and just for fun at the game with your favorite team. This is a beautiful girls size 9/10. All seams are professionally and carefully sewn and serge for reinforced, double - stitch durability. Have added ribbon to enhance the dress. Also do special orders.just convey your ideas and sizes.1/2 week turn around. Wado. Hand made 3x6, appliqué is stitched/sewn. Federhaube (Warbonnet), lang, mit weißen Federn, Wildleder Kappe und Schleppe, Kunstfell, Perlenstirnband und seitlichen Perlenmandalas, ca. 160 cm. Handgearbeitet und somit ein Unikat. XXL Federhaube. You are looking at a Montana West wallet with an Evening Tapestry Pattern. A zipper enclosure for the entire wallet. Single removable strap to convert the wallet into a wrist-let. Pockets on the inside for ID, credit cards etc. In great condition, no cracks or missing beads. This rainbow striped vest is very rare compared to the typical Southwestern Indian Prints on other Chimayo Vests. No Buttons. Very good condition! You will not be disappointed. Good, economically priced bonnet for ceremonies, etc. Bridle string is long, so you can adjust the spread if you wish. Belt is unmatched and 32” long. 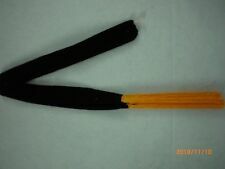 Headband has elastic back. All beadwork is on canvas and backed. All leather is braintan buckskin. Native American style Shawl, U-Neek Rabbit Shawls; Some people say they are like wearing a hug.Traditionally they are Native American shawls.We have fused them with other cultures and art.Custom orders are encouraged. Let us design one just for you.They can be used for prayer and by energy workers, healers, Pow-Wows and just for fun at the game with your favorite team. Vintage CHIMAYO Tujillos Purse Hand Woven Native American Wool Rug 18"
Thunderbird on one side, star/eye dazzler on the other. Lining in very good condition. Pair of Vintage Hand-Embroidered Table Doilies Southwestern Native American Design. Taupe (light brown) embroidered designs on soft white cotton. Beautiful for wall-hanging, framing, or displaying on table or chairs. Each measures 12" x 13.5". Last picture is the underside. Uncertain about history but obtained from 100-year-old estate. This Jingle Dress pullover and Under Dress has detailed sewing along the edges. Nine rows of Gold cones surrounding the dress. The cones are 2 1/2 inches long . Under Dress has long sleeves. Dress size 12. You are looking at a Montana West pocket book /purse. Purse is 15" long, 5.5" thick and 8" tall. Gorgeous purse! One socket, nicely hand crafted stamped heavy guage German Silver roach spreader. The feather holder is 1 3/4" high. It is ready to decorate and enhance the look of your roach. Roach Spreader. ><><><>< Federhaube mit echten weißen Federn,schwarzem Kunstfell und Fransen. Jeder Kopfschmuck ist handgearbeitet und somit ein UNIKAT. Indianer KOPFSCHMUCK. weiße Federn mit schwarzem Fell. 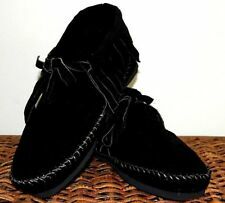 Plain, high-top leather moccasins. The shirt and moccasins are fairly small. Leather, beaded war shirt. I HAD TO TAKE THE SLEEVES APART TO EMBROIDER THE EAGLE FEATHERS ON THE SLEEVES (QUITE A JOB). 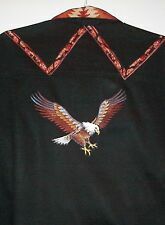 I THEN EMBROIDERED TWO EAGLE FEATHERS ON THE BACK - FACING EACH OTHER. HOPE YOU LIKE. Ladies/Teen Dance Shawl Kit. Everything you will need to complete your own dance shawl. We also included a sample piece that is fringed and tied so that you may easily copy the process. The photo does not show the 3 yards of fringe. I HAVE EMBROIDERED AN EAGLE IN FLIGHT ON THE BACK OF THE SHIRT - AN EAGLE FEATHER ON THE POCKET AND AN EAGLE FEATHER ON EACH SLEEVE. HOPE YOU LIKE. "Native American Style Shawl,Pow-Wow,Regalia,Limited Edition, On Faux leather Fleece lined ****Limited edition print fabric***. You are looking at a Montana West wallet from the Trinity Ranch collection. A zipper enclosure for the entire wallet. Single removable strap to convert the wallet into a wrist-let. Pockets on the inside for ID, credit cards etc. Seminole Patchwork Jacket Featuring 🔥 Fire Colors! Can be made from sizes: S-2XL. The jacket is fully lined. All seams are professionally and carefully sewn and serge for reinforced, double - stitch durability. Have added satin ribbon to enhance the dress. Has matching legging to finish off this ragalia. Pendleton T-Dress & Shawl c2701. A traditional Plains Style T-dress done in green and burgundy plaid Pendleton 100% wool suiting. The keyhole neckline is self bound. Add your own belt and accessories and you are arena ready. All seams are professionally and carefully sewn and serge for reinforced, double - stitch durability. Have added cordinating rograin ribbon to enhance the dress. Also do special orders.just convey your ideas and sizes.1/2 week turn around. Wado. Head Roach is in good condition, it is about 15" long from head to base. Handmade in Western South Dakota.